Mango is one of the most famous tropical fruits. Since its pulps are fine and tasty, it is loved by many people. It even enjoys the title of the "king of all tropical fruits". 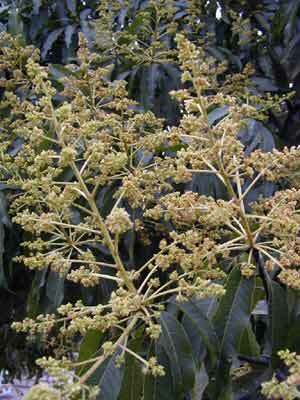 Mango is a kind of evergreen arbor and it may grow as tall as 9 to 27 meters. Its leaves are green and bright; the flowers are red or yellow, which are small but numerous; besides, mango trees could live as long as several hundred years. Mango originates in India and Malaysia, and India has a long-standing history for planting of mango trees. India produces the most mango fruits in the world and its output accounts for 80% of the world mango output. Wild mango fruits are not edible; the people of India discovered wild mango trees quite early and they cultivated them into a plant that can produce edible mango fruits. It was said that an ardent believer once donated his mango orchard to Sakaymuni to let Him rest under the trees. Until the present, we can still see various decoration patterns with mango leaves, flowers and fruits in the Hinduism temples. The Hinduism believers believe that the five mango flower pedals represent the five arrows of Kamadewa, the god of love; therefore, they use mango to provide sacrifices for their goddess, Salaswadi. During the period of 1556-1605, the Indian King had a mango orchard of more than 100,000 individual plants, and such a huge orchard was seldom seen at that time. Nowadays, people generally believe that the first person who introduced mango to places outside India was Monk Xuanzang, a famous monk of the Tang Dynasty. In his book "Travels to the West", we can read records such as "mango of India is a rare fruit of the world". Later, Mango was introduced to Indonesia, Thailand, Malaysia, and Philippines etc., and then to the Mediterranean countries. It was then spread to Brazil, West Indian Isles and America etc in the 18th century. Now, we can find large stretches of mango orchards in these places. The major criteria for telling the variety of a mango fruit include the size of the fruit, shape, color, fiber, and pits of the fruit. However, mango has many varieties. In the past, people used seed-born seedlings to produce mango trees; therefore, many naturally crossed mango varieties came into being. Even now, new mango varieties are continuously bred. For example, the researchers of Philippine University cultivate a mango variety that has no pit. There are more than 1000 mango varieties in the world today. Because mango fruits have different varieties, the largest mango can weigh as much as several kilograms, while the smallest ones are only as big as pears. Their shapes are quite different too: some are round, some are elliptical, some are heart-shaped, and some are kidney-like. The colors of mango fruits also varied, including green, yellow and red etc. The color, smell and flavor of mango fruits are all very good, and mango fruits are nutritious too. Each 100 grams of mango fruit pulp contain 56.4 to 137.5 mg or even 189 mg of Vitamin C, and 14% to 16% of sugar. Mango seeds contain 5.6% protein, 16.1% fats, and 69.3% carbohydrates. Eating mango could benefit the stomach, satisfy the thirst, and aid urines. Ripe mango fruits can be used as insecticides too. Mango pulps are juicy and yummy, and they have the flavors of peaches, apricots, pears and apples, etc. If someone eats some mango fruits in hot summer time, he can not only satisfy his thirst, but also wipe out the heat inside his body. Because it is difficult to store mango fruits up or to deliver them to longer distances, mango fruits are processed into canned fruits, fruit wines, and fruit juices etc. The Dai folks of Xishuangbanna like making mango into syrups with unconventional flavors. Many countries of the world have their favorite mango varieties. The people of Thailand like a kind of mango named "Brahman who sells his wife". The story goes like this. A Brahman loved mango fruits so much that he sold his wife and used the money to buy mango fruits. The people of India regard their Afangsuo mango as a rare fruit. The people of Sri Lanka like ruby mango. The people of Philippine like Jialabaao mango, but in the recent years, they change the name into superb Manila mango to improve the sales. Provinces that plant mango for commercial purposes in China include Guangdong, Guangxi, Fujian, Yunnan and Taiwan etc., and Hainan Island plants the most mango trees in all provinces in China.